I’ve been struggling with the fact that he’s not here yet- dying to finally hold my baby boy in my arms! And it didn’t really hit me until this week that Becca might be really ready for him to arrive, too! She seems to fully understand that a baby is coming- she looks at the tiny diapers and sees her old crib and changing table all ready for a boy, and I think she’s starting to get it. She saw a pregnant woman at the grocery store yesterday, pointed, and said “Baby in dere! Grayson? No, Grayson mommy tummy.” That’s when it fully hit me that maybe she understands more than I think she does! A friend suggested a craft project- her son did a painting for their new baby girl’s room before she was born as a way to prepare for the impending birth. I loved the idea! So yesterday we trekked to Hobby Lobby, where Becca picked out blue paint, an oval canvas, and an airplane- to make a painting for her lil bubba’s room. She was SO EXCITED! When we got home, she painted the entire oval blue, and then after her nap she had help to paint his name in white paint and then used her fingers to paint white clouds. She had so much fun and talked about painting that “oh-fal” all evening. 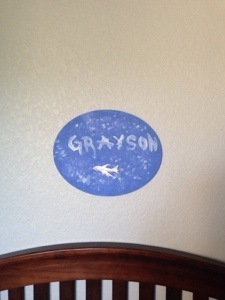 After she went to bed, I attached the airplane and her daddy hung the canvas over Grayson’s crib. I know she’ll be so excited to see it hanging up today, and I bet she tells Grayson a million times that she painted that for him. 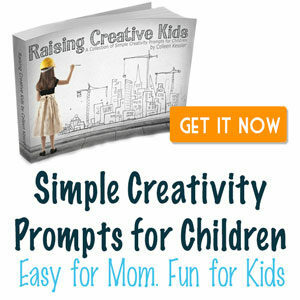 What a fun, easy, inexpensive (esp since Hobby Lobby had canvases 50% off this week!) project to really help her feel included in the preparations for baby brother! Now if only he would get here….